Methicillin-resistant Staphylococcus aureus (MRSA) probably emerged in Singaporean hospitals in the 1970’s. The exact date, and whether the first isolates were imported from overseas or arose from within Singapore’s own S. aureus population is no longer known (or at least I have not been able to find someone who has a clear recollection of these events). 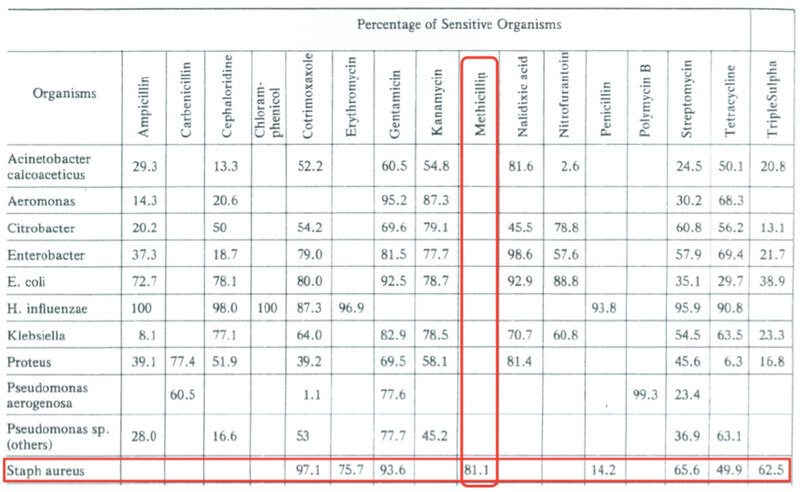 We do have some evidence that it had become a significant problem in the hospital by the late 1970’s – there’s a snapshot of the annual bacterial susceptibility testing report from one of Singapore’s hospitals in 1979, showing that almost 19% of S. aureus isolated that year were methicillin-resistant (on a separate note, the antibiotics on the panel may also be of some historical interest – it is sobering to note that many of the antibiotics we take for granted today, like ceftriaxone, carbapenems, and the fluoroquinolones, were not available then!). Annual antibiogram extracted from a local hospital’s report, 1979. Separate corroboration can be in a paper published in 1986 by Prof Warren Grubb (Perth, Australia) and Dr Tay Leng (Singapore General Hospital, Singapore) in the European Journal of Clinical Microbiology. 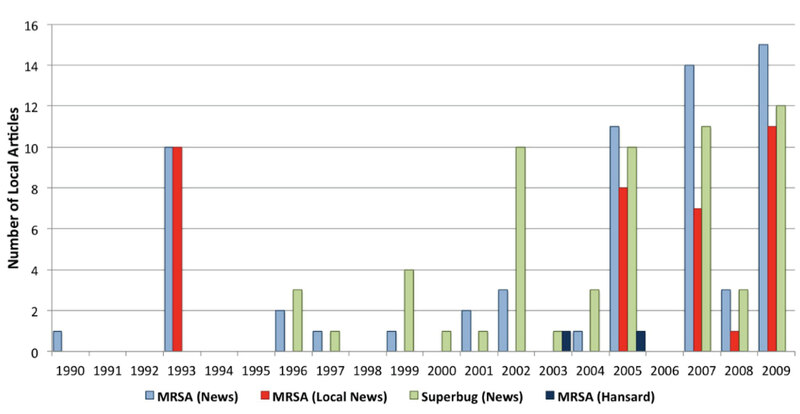 The authors stated that MRSA rates in Singapore General Hospital had increased from 12% of all S. aureus clinical isolates in 1982 (a lower figure than in the 1979 report) to 16% in 1983 and 27% in 1986. Although the initial speculation was that the MRSA in Singapore could have come from Australia in view of the “large tourist trade”, this was not borne out on molecular analysis of the Singapore isolates. It’s not easy to access this old paper, hence I have taken the liberty of providing it below. Truly hard-hitting! It is my personal belief that this series of press reports and forum letters, directly or indirectly, in addition to the pressure exerted by concerned clinicians, resulted in the implementation of the first major MRSA campaign in Singapore hospitals.